“On the third day you (God) commanded the waters to be gathered together in a seventh part of the earth, but you made six parts dry and preserved them so that some of these might be sown and cultivated, to be a service before you." A mappamundi ("world map") drawn according to the instructions of Strabo (a first century contemporary of Jesus). Note how the known world consists of a single landmass that stretches from the Iberian to the Indian peninsulas. Ideas of the classicists such as Strabo and Ptolemy continued to exert force into the medieval period. This map represents the "state of the art" when Columbus was contemplating his voyage. Image from here. Christopher Columbus also read Esdras and did the math. Biblical exegesis is partly why the Great Admiral of the Ocean believed that it was a small world. ** Doesn't the text suggest that dry land goes 6/7th of the way around? This means the other 1/7th would therefore be the sea, right? Behemoth got the better part of this deal. Leviathan could only steam. Columbus was convinced that the gap separating the West from the East could be crossed. Of course, he was wrong. And so was Esdras. 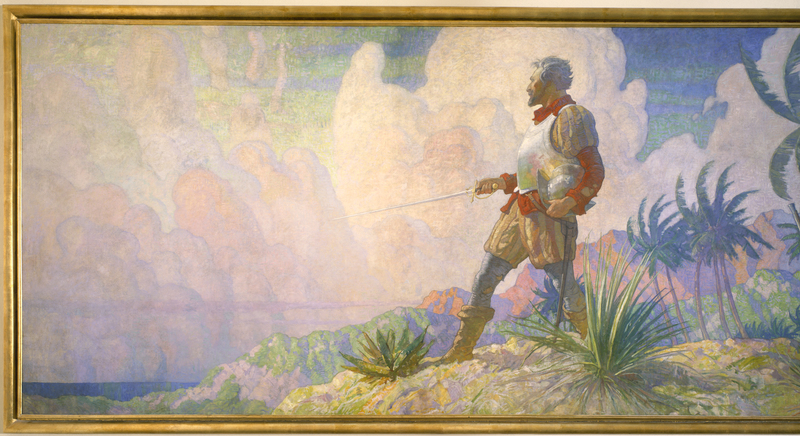 Every romantic must love the illustrations of N. C. Wyeth. This is his "Ships of Christopher Columbus at sea" (1927). Image from here. In the meantime, Columbus fussed with lunar eclipses, fudged the numbers, and bequeathed to historians a legacy of measurements that has caused no small amount of head scratching. I am no one to judge, but in another life I'm guessing he could have worked for the Congressional Budget Office. It is a large world for that technology, my dear. Another Wyeth. Detail from a painting titled "The Discoverers." It is part of a series that celebrates exploration by land, sea, and air. For the source, see here. *The book of 2 Esdras is a part of the literary legacy of the Hebrew Bible, but is not found in the Hebrew or Protestant canons. It is located in the Apocrypha of the King James or the Revised Standard Version of the Bible. **This is suggested by Eugene Lyon in his "Navigation and Ships in the Age of Columbus." See page 93 in The World of Columbus, J. R. McGovern, ed. (1992). ***Dava Sobel's fascinating book should really go on your reading list. See her Longitude: The True Story of a Lone Genius Who Solved the Greatest Scientific Problem of His Time (2007). ****Figures presented by Evelyn Edson suggest that Columbus estimated the distance from the Canaries to Japan to be 2,400 nautical miles. The distance is closer to 10,600 nautical miles. See her The World Map, 1300-1492 (2007: 203).